Wikimedia Philippines and Mozilla Philippines hold their 3rd Open Web Day on May 19, 2012 at 8am-4pm at TPIC and BANCOM Rooms of Asian Institute of Management (AIM), 123 Paseo De Roxas, Makati City. This is in cooperation with the people from Computer Professionals Union for a whole day event of open source activities. Note: AIM is located near Greenbelt 1. Open Web Day is a free monthly mini-workshop that aims to teach how to edit Wikipedia entries online. 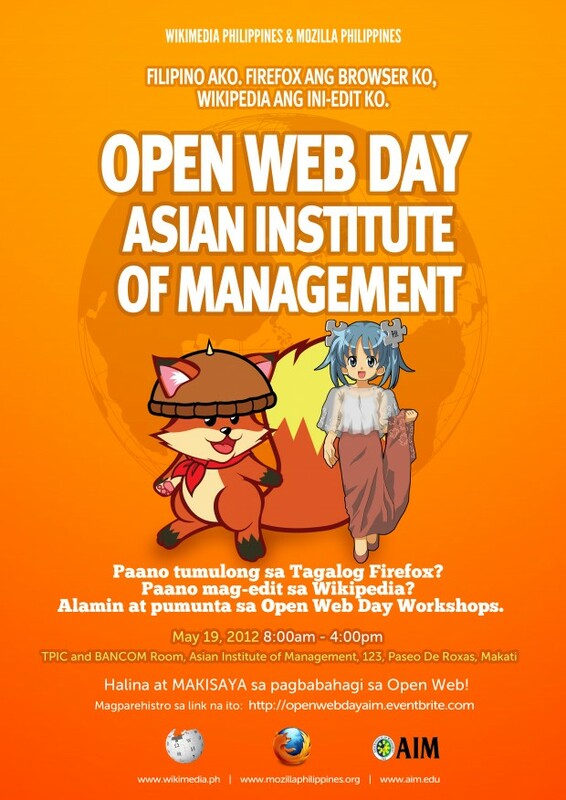 To know more about the Open Web Day, you may read about the wiki made by Wikimedia Philippines. Slots are very limited. Register only when you are sure that you're attending. Register here. Those who officially registered and who will receive confirmation from the organizer will be admitted to the workshop. Be sure to let us know if you can't attend a day before the event. Please be guided accordingly. Please Bring your own laptop / tablet PC. Lunch will not be provided.